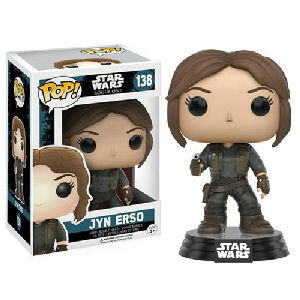 We have Just Sold out of Star Wars Rogue One Jyn Erso Pop! Vinyl Bobble Head. This Item is unavailable at present. From the Star Wars Rogue One Pop! Vinyl collection by Funko. Star Wars Rogue One Jyn Erso Pop! Vinyl Bobble Head Measures 3.75 inches tall and comes with a decorative Star Wars stand.